On my last birthday a few of my friends got together to give me one of Devon Baer's ruffled tunics as a present. I ADORE it! It has been my casual Holiday uniform for the last two seasons. I love pairing it with jeans and with either a beautiful statement necklace or earrings for those little Holiday cookie exchanges or informal open houses. And each time I wear it I have at least three people ask me where I got it (promise it's true). The designer changes her prints from year to year. This, this, this and this green one are my favorite ones. See more styles here as well. You can say this top is my secret weapon when I want to look festive but relaxed. 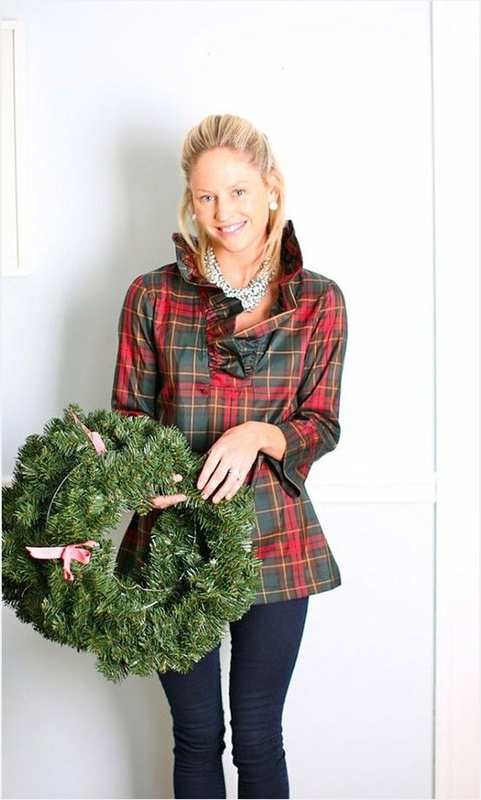 It's chic, preppy and holidayish (I love how we bloggers constantly make up words). An all-in-one if you will. There are also non-plaid options as well and there are always cute prints for the Spring as well. I have an amazing giveaway tomorrow....so stop on by! I love everything Devon Baer does and I HAVE to have one of these!! Ok, this tunic just catapulted to the top of my Christmas wish list - it's absolute perfection!!! I love that last one...the colors are perfect, and the ruffled collar is so girlie and fun! I have one of her dresses and same thing -- tons of compliments when I wear it! Devon's designs are amazing! What a cute top! Love the collar ruffles! I love this blouse for the holidays! I just clicked over and saw some great things (that elephant wrap dress is amazing). Thanks for the introduction! OOOOOHH I love the look of these! I def can see why you would get so many compliments. Oh I love this look. So simple and easy and classic. Ok I NEED one of these. As a reward for living through four days of no power and not making Travis take me to a hotel. The power will be back on today, right???? Fingers crossed. what a great holiday shirt!! These are adorbs! I love the ruffles and the plaid is so festive for the holiday. these tunics are so lovely and love the fun holiday type prints! These are so not my style but so lovely and classic! I love the plaid prints! I want this shirt! It's so chic! LOVING the berry/white tunic...pretty and festive!! These look really cool. Like the mix of tomboy and femininity! so glam! love the plaid! loving that shirt. Perfect for the holidays.